29 March 2017, 11:53 AM. Hey guys, and welcome to another You Should Read This. Quick sporking status update – I finally got a copy of City of Glass and am working my way through it. I did decide to scrap what notes I’d already taken, mostly because I was slipping into sporking, rather than taking notes. I’ll try to keep up with that, but I’m also doing Camp NaNoWriMo in April, so we’ll see how that goes. But enough of that. Today, I have another rarity for this series – a sci-fi book recommendation. This time, it’s Leviathan Wakes, the first book in James S. A. Corey’s Expanse series. Why yes, hypothetical reader, there is – the TV show is an adaptation of the books. In fact, most of the first season is based on events from the first novel. I haven’t seen any of the latest season though, so I can’t judge how much it might have deviated from that. What I love about this series is that it incorporates a lot of stuff from some sci-fi works that I really love: the grand political stuff from Babylon 5; the small, personal crew stuff from Firefly; and even a bit of sci-fi noir ala Blade Runner. 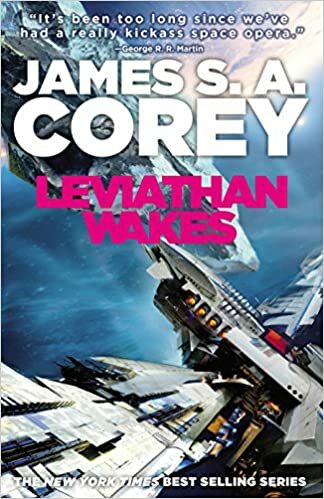 Leviathan Wakes is really more like two novels that happen to intertwine near the end, which is fitting, as James S. A. Corey is actually two people – Daniel Abraham (another author I might talk about at a later time), and Ty Franck. The two plots are very different, but they work well together. The first is a fairly standard sci-fi space opera, told from the perspective of Jim Holden, a guy from Earth who works on a ship that hauls ice from the rings of Saturn to the colonies in the asteroid belt, and gets caught up in some crazy conspiracy stuff when he decides to respond to a distress call. This is the Firefly-esque stuff – most of the focus is on Holden and his crew, who spend a good chunk of the book completely unaware of what’s going on in the wider solar system, despite being at the heart of it all. The other main plot is more noir mystery with some sci-fi trappings. It’s told from the perspective of Detective Miller. Miller works security on Ceres, the main colony in the Belt. He’s not nearly the idealist Holden is, which is a nice contrast. While he’s aware of the growing tensions between Earth and Mars, not to mention Outer Planet’s Alliance (a group that walks the line between being freedom fighters and terrorists), Miller doesn’t want any part of it. He gets sucked in when he’s assigned to find/kidnap a girl by the name of Julie Mao. How does this connect to Holden? Well, that would be spoiling it, but rest assured, there’s a connection. One of the random things I like about this book – actually, the whole series – is how it’s a lot harder than most sci-fi I’ve looked at in the past. For those who don’t know, “hard” science fiction is where the science actually works, and scientific laws and principles are obeyed. Here’s an example: in most sci-fi properties dealing with space travel, there’s some means of faster-than-light travel. This allows characters to do things like travel to other planets and star systems with relative ease, presumably where they can do other things like meet intelligent alien life. In hard sci-fi, you can’t do that. Ships traveling through space are restricted to a maximum speed of that of light, unless including some kind of work-around, like using wormholes. So yeah, space travel in Leviathan Wakes is slow. Slower even than in the TV series. It takes days, weeks, even months to go relatively short distances. And I like that, if only because of the novelty of it (in my experience, at least). That’s not to say that this series doesn’t do a bit of hand-waving when necessary. But when it does, it’s either A) a background detail to allow the setting to function, or B) specifically acknowledged in-book as defying our current understanding of physics (no, I’m not going to spoil it). So there you go. If you’re looking for good sci-fi series with a focus on good characters, large-scale politics, and some pretty accurate science, then pick up Leviathan Wakes. Hurm. I’d actually heard good things about the TV show, and seen in favorably compared to Firefly (it was in a Cracked article I think?). Still, I didn’t really have time to check out the TV series. But now that I know it’s based off a book series, I might check out those instead. I’m always happy for book recommendations. And as much as I’m excited to see your next sporking, I wanted to let you know that I’m working on an article or two, because I don’t want you to feel like you have the full burden of being the one person to publish articles on the site. I truly like the contents which is expressed in a very good manner. This post contains helpful facts which are the helping hand to the readers. Always this blog has very helpful details. Keep writing beneficial post. We are so much happy to change language on wiki links about Axel heinemann. Now any user can read the details from “top essay writing websites”:https://canadianessayreviews.com/ with best resource. Many people are like to read the following articles about these wikies. We gathered fantastic articles and reviews to read top services review at legitimate-writing-services.blogspot.com website. Many instructions they are given to help our college and school students. most of them search this website.